Turning Jubilee into a vampire was one of the most nonsensical X-Men plot developments of the past 20 years. Vampires were really hot in pop culture because of Twilight, and in 2010, Marvel decided to turn Jubilee into a vampire to capitalize on the trend. 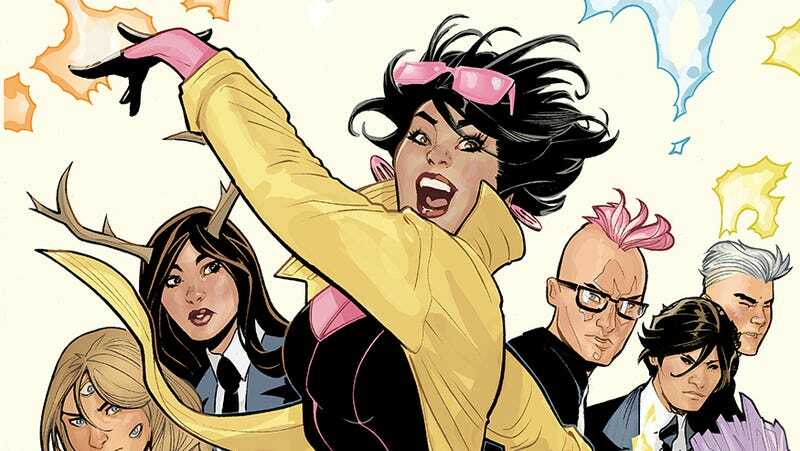 Jubilee had already lost her mutant powers thanks to the House Of M event, so this gave her a reason to stick around the superhero team, but, with the exception of a very fun turn in Patsy Walker A.K.A. Hellcat!, most creators failed to make her vampirism a compelling plot point until last year’s Generation X revival. Writer Christina Strain, artist Amilcar Pinna, and colorist Felipe Sobreiro have done right by Jubilation Lee, and in this week’s penultimate issue of the series, they cure the character of her vampirism and restore her firework-shooting mutant abilities. Generation X had yet to address the events of last year’s The Mighty Thor storyline putting psychic teen bad boy Quentin Quire in the middle of a conflict between intergalactic gods, but this week’s Generation X #86 finally revealed where that fit in this book’s timeline. That Mighty Thor arc ended up containing the key to bringing back Jubilee’s old mutant status, and Quentin Quentin uses his newly obtained Phoenix Shard to heal his teacher when her life is in danger. Strain has had the intention of restoring Jubilee’s mutant powers for most of the series, and knowing this end point influenced how she approached the character over the past year. “I knew her vampirism was probably going away so I wanted to highlight it in a few ways before losing it. And that includes the whole idea that Jubilee’s biggest fear was losing control and snacking on [her son] Shogo/her students. Also being a vampire’s been a big part of her life for several years now, but unlike her mutation, it wasn’t something she was born with, so I wanted to highlight how Jubilee’s grown and become comfortable with who she was before the fangs.” The A.V. Club has a first look at the cover for next month’s final issue, on sale February 21, which shows Jubilee back in all her fang-less, pyrotechnic glory.